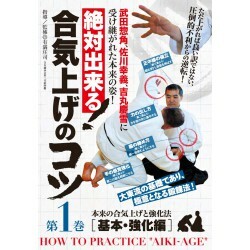 Aiki-age no kotsu Vo.1 ”Kiso ・Kyoka” - How to pracrice Aiki-Age - Arimitsu Shoji Time:63min.Language：Japanese Aiki-Age helps to make a strong body adapted to Bujutsu. Aiki no kaitei vol.1 -Kogen SUGASAWA Language: Japanese 60mn Presentation of the 3 levels of Nihon den Aiki jutsu: Jujutsu, Aikijujutsu and finally Aiki no Jutsu, which constitutes the highest level of this art with techniques reserved for experienced practitioners. Aiki no kaitei vol.2 -Kogen SUGASAWA Language: Japanese 50mn Presentation of the 3 levels of Nihon den Aiki jutsu: Jujutsu, Aikijujutsu and finally Aiki no Jutsu, which constitutes the highest level of this art with techniques reserved for experienced practitioners. Aiki no kaitei vol.3 -Kogen SUGASAWA Language: Japanese 50mn Presentation of the 3 levels of Nihon den Aiki jutsu: Jujutsu, Aikijujutsu and finally Aiki no Jutsu, which constitutes the highest level of this art with techniques reserved for experienced practitioners. Aiki shinden Vol.1-Seigo OKAMOTO Language: Japanese 45mn First volume of "Aiki shinden" series. Aikijutsu Training in Hawaii in 1992, given by Master OKAMOTO. Aiki shinden vol.2-OKAMOTO Seigo Language: Japanese 45mn Second volume of "Aiki shinden" series. Aikijutsu Training in Hawaii in 1992, given by Master OKAMOTO. Aikido Master N°1 Kihon hen (beginner level) - Yasuhisa SHIODA Language: Japanese 102mn DVD dedicated to the preparation of grading from 10th to 4th kyu. Aikido Master N°2 Kihon hen (beginner level) - Yasuhisa SHIODA Language: Japanese 150mn DVD dedicated to the preparation of grading from 3rd to 1st kyu.